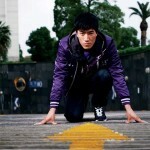 Nike Sportswear has tapped Chinese athlete and Olympian Liu Xiang to work with them for the holiday 2010 lookbook. A casual, lifestyle oriented brand, the lookbook emphasizes the casual appeal of Nike Sportswear’s pieces, showcasing comfortable hoodies and classic varsity jackets. Definitely feeling the grey hoodie with the red trim, which just looks perfect for pick-up games in October and November.